In June, 2017, Green Turtle Cay’s Hubert (“Hubie”) Pinder received the news nobody wants to hear. At 72, he was diagnosed with colon cancer. Though the disease had already touched many members of his family – and taken the lives of his sister, nephew and niece – Hubert was ready and determined to fight. After surgery to remove the cancer, he began a year-long course of chemotherapy. 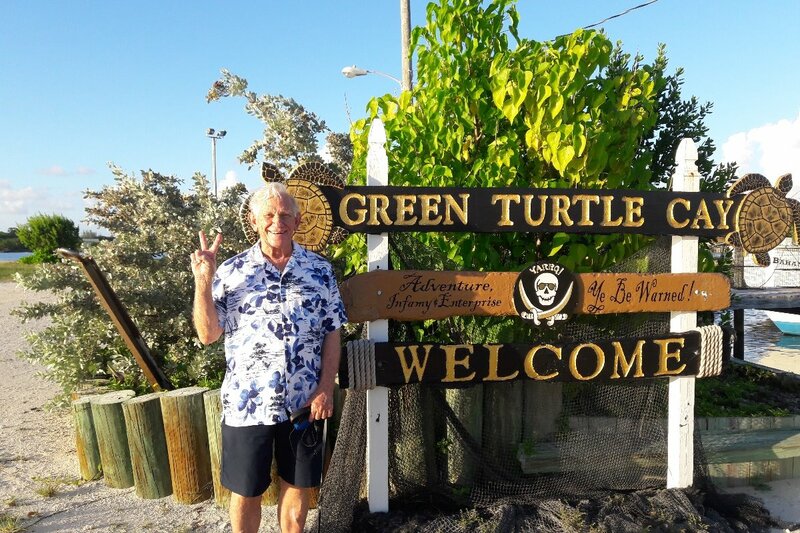 Fortunately, his treatment was in pill form, meaning that in between his quarterly check-ups in Nassau, Hubert was able to return home to Green Turtle Cay. At the end of his treatment, Hubert received the news we had all hoped for. No sign of cancer remained. He was cured. His doctors warned, however, that there was always a chance the cancer would reappear. Six weeks ago, during Hubert’s quarterly check-up, doctors discovered that his cancer has not only returned, at an aggressive rate, but has spread to his stomach lining. So, on Monday, March 18th, he will undergo surgery to have a chemotherapy port inserted. Once the area around the port has healed, Hubert will begin a more intensive course of chemo, which may require him to remain in Nassau for extended periods of time. Unfortunately, for many Bahamians, private health insurance is prohibitively expensive. And though Hubert remains positive and upbeat, the reality is that his surgery and cancer treatment will cost him tens of thousands of dollars. To get the care he needs, he’ll need to pay out-of-pocket for doctors, nurses, x-rays, scans, chemotherapy and much more. On top of that, he’ll have expenses related to his travel to Nassau, and meals and transportation while he’s there. Due to his illness, Hubert has had to close his popular Green Turtle Cay business, Hubert’s Cuts & Curls, meaning his income has been dramatically curtailed just when he needs it most. Since 1985, when Hubert returned home to Green Turtle Cay and opened Hubert’s Cuts & Curls, he’s been a much-loved member of our community. Whether feeding the local stray cats, helping raise funds for the town’s annual fireworks display, or discreetly lending support to family members and friends in need, Hubert has always been there for others. And now it’s our turn to be there for him. This page has been established by Hubert’s family and friends to help pay for his treatment and expenses, and to give him the peace of mind he needs to focus all his energy on getting well. We hope you’ll help by making a donation and by sharing this page with anyone who might be able to help. And if you’re so inclined, please send up a prayer or send along positive, healing thoughts for Hubert as he faces this fight. Hi, everyone. On March 18, Hubert had surgery in Nassau to have his chemotherapy port inserted. Though the operation went well, he’s been having some difficulty with stomach pain and nausea. Still, he remains as positive as ever and ready to fight this cancer. He’s scheduled to have blood work done on Tuesday, April 2nd and to undergo his first chemotherapy session the next day. At this point, the plan is that he will receive six rounds of chemotherapy, each three weeks apart. After that, testing will be done to determine whether (and what type of) further treatment will be required. Hubert is staying at the Bahamian Cancer Society’s “Cancer Caring Center” in Nassau. He’s very comfortable there, and says that the center truly lives up to his name. Everyone has been so kind and caring toward him, for which we are so grateful. We’ve told Hubert about the response to date on this GoFundMe page, and about the many people who have asked after him. He wants you all to know that he is so very thankful and touched by the kindness of everyone who has donated, called, visited or sent along their prayers and well wishes. Thank you for your continued contributions to Hubert’s GoFundMe page. Our aim is to raise as much as we can toward his medical bills, so he can focus all his attention on just getting well. We’ll provide another update as soon as we can. In the meantime, if you’re in Nassau, feel free to drop in and see Hubert. Visitors are welcome at the Cancer Caring Center, which is next to the Cancer Society Headquarters on East Terrace, just off Collins Avenue. He will have to go out for doctor’s appointments and treatments though, so do call 242-323-4441 before you go, to be sure he’s around and that he’s up to having visitors.